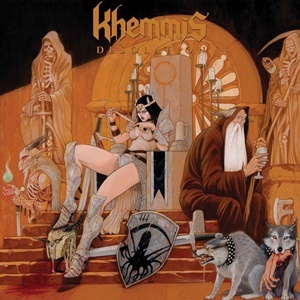 Doomed heavy metal from Denver, Colorado – receiving rapturous praise from the underground for their first two albums Absolution and Hunted, it’s a prime-time spot for Khemmis to elevate their stature in the scene if they knock it out of the park for a third full-length. Aiming to provide symbiosis on a songwriting, performance, and emotional level, it’s clearly evident that the band spent their time crafting the ideal musical/vocal hooks, constructing the best transitions, build-ups, and harmony possibilities, while maintaining the essence of epic doom and heavy metal all in one. Guitarists Ben Hutcherson and Phil Pendergast serve and volley numerous riffs that beg for air guitar action – be they Grand Magus in scope for “Isolation” or Slough Feg/Thin Lizzy thrown into the fuzzbox bender on the follow-up “Flesh to Nothing”, it’s the stuff of legends my friends. 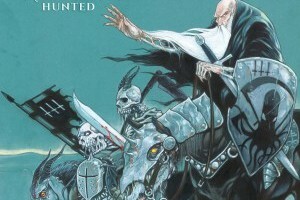 The foundation obviously comes from Black Sabbath, Candlemass, and other offspring – but there’s this added classic heavy metal magnificence that appears unparalleled to most in this genre, a proper respect and admiration for epic, 80’s-style efforts when Iron Maiden, Judas Priest, and Mercyful Fate carried creative control on the younger generation of the genre. The clean to growl ratio is 85/15 – which makes for alluring combinations and hypnotizing melodies, although some will believe at this point Khemmis could drop the growls and go full-on with the dynamic twin harmony playoffs under conventional means. Six songs may seem scant to some, but at 41-minutes there’s a great sense that the quartet has delivered just enough to tantalize and traverse through hundreds of playbacks – from the spacious doom of “The Seer”, into the measured guitar bends, folk-like heavy instrumental transition, and evil darkness for the 9:27 closer “From Ruin”, you will more than get your money’s worth for entertainment value here. You feel ‘the noose is gripping at my neck with every breath’ uttered during the opening track “Bloodletting” as ‘the executioner calls out a final time’ – the lyrical content matching up to the haunting music, picturesque and captivating on that next level. Probably in league with Pallbearer as future leaders of the doom-oriented melodic heavy metal movement, Desolation pulsates with right hook after right hook in terms of the riffs, parts, proper flow, and as a result demands everyone’s attention no matter what your preferred genre at the moment is. Khemmis deserve all the kudos and audience affinity thrown their way – we can only hope that the quality continues to excel from here.